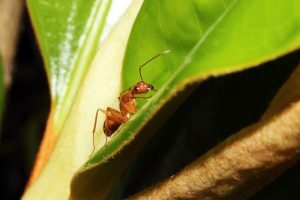 WHY ARE CARPENTER ANT NESTS HARD TO CONTROL? ARE YOU SEEING CARPENTER ANTS WITH WINGS? Carpenter Ants are one of the largest ants we have in the United States. Their range is throughout our country. 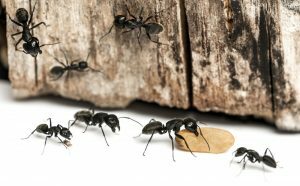 Typically you’ll know you have carpenter ants because you’ll start noticing large, black ants foraging randomly on, in or around the home. In general, carpenter ants are large and black. But there are two variations of the species which are quite different. The second most common species is the Florida Carpenter Ant. These ants are a bit smaller, travel less than their cousins, and have a wide range of colors including yellow, red, light to dark brown and black. A yellow carpenter ant searching for a meal on a leaf. 3) Chewing on wood structures and in wall or ceiling voids for nesting. Though they don’t eat the wood, they will readily damage it with the result being long hollow cavities, sawdust (aka: frass) and weakening of structural members. Damage by carpenter ants in a two-by-four piece of wood is evident in this exposed, interior bathroom wall. 5) An ability to avoid chemically treated areas and find new ways into a structure when traditional sprays are used. 6) Networking of nests so there is no “main” nest but instead, a series of linked nests making control of the problem a bit more complicated. Unlike most ants, carpenter ants will set up a series of nests which are all “linked” together. This network of nests can be in series enabling foraging workers and scouts to have a place of safe haven when out and about doing their chores. This structure also helps to preserve any one colony because it’s rare that all the members will ever be in one location at one time. Should any one “satellite” nest be destroyed, the other nests will usually have enough members left to enable the colony to move on and survive. This nest characteristic is also why controlling carpenter ants can be a challenge. If you only get 1-2 of their nests but miss even one satellite colony, they will typically try to rebuild by either repopulating the affected nest or by moving close by to a “safer” location. This is why a thorough and complete treatment is needed when implementing a carpenter ant program. The following video demonstrates just how determined and agile these ants can be. This footage was taken of a colony that was in the midst of relocating their nest. Recent rains was flooding out their in ground nest and they were prepared to move up and out of the water. When moving they’ll grab eggs and pupae first thus insuring the survival of their family members. Another sign you have a carpenter ant infestation is if you happen to find a lot of large black ants with wings. Like most any ant, carpenter ant colonies will generate “swarmers” also known as “kings” or “queens”. These winged reproductives purpose is to leave an existing nest to fly away and land somewhere to start a new nest. Swarmers tend to be released during the spring but may be found at any time. If you are finding these in the home, chances are there is a nest located somewhere on the structure. And when located on the home, swarming can happen at any time, any season in the year. The following video shows an actual carpenter ant nest that was created in a deer feeder just outside a home. From this nest the ants could invade several homes due to the proximity of the nest in this residential community. More importantly, if left untreated, these carpenter ants would undoubtedly create many more nests. Watch carefully and you’ll be able to see swarmers, the ones with wings, as well as all different sized worker, scout and nurse ants. If you suspect you have a carpenter ant problem, try to determine the magnitude of the issue. Getting answers to the following questions will help in deciding where you’ll need to treat. If in the home, are the ants active in just one area or throughout the structure? Are they originating from a nest in or on the building or from a wooded lot alongside the structure? Does your regular pest control program (whether you do it yourself or use a service company) include perimeter treatment of the ground and/or foundation of your buildings? With answers to these questions, you can take the next step and treat using either one or more of the following options. The general approach is to use a direct nest treatment when you know where nests might be located. But if you have no idea of nest sites, the use of bait and non repellent spray will be the best approach. Although most people are compelled to spray when they seen ants, the use of a traditional active won’t work. This is true for several reasons. First, ants only send out a small amount of active workers so even if you spray them directly and kill them, their nests will just keep sending replacements. Second, ants can easily detect traditional actives and will merely avoid where you spray. This will cause them to form new scent trails, nests, etc. which will only complicate the problem. To avoid this scenario, you need to use a stealthy approach. And the best materials for this is a special bait and a unique spray found in very few products. The spray is the first material you need to apply. For most homes, PHANTOM AEROSOL will do the job. It uses an active ants cannot detect. This means they’ll readily walk over the treatment, pick up some chemical and over a few days, bring it back to their nests and share it with other members of their colony. 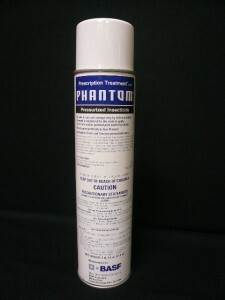 Phantom should be applied to all baseboards, around door ways, windows and basically any crack or crevice around any room. One can of Phantom will be enough to treat most homes at least 1-2 and should be used every 2 weeks until the activity ceases. Keep in mind Phantom takes 2-4 days to kill insects so you cannot kill anything quickly. But this is very much by design and ensures the active will infiltrate their nest. Another option is the liquid form PHANTOM. Like the aerosol version, Phantom won’t be noticed by foraging ants so they’ll readily walk over the treatment, pick up some active and bring it back to their nest. Phantom is odorless and non-repellent so it won’t spook the ants. Add 1.5 to 3.0 oz per gallon of water and expect to use about 1/2 to 1 gallon of mixed material per treatment. You’ll need a good PUMP SPRAYER to apply the Phantom. Just make sure your sprayer is clean, odor free and contains no remnants of herbicide, etc. 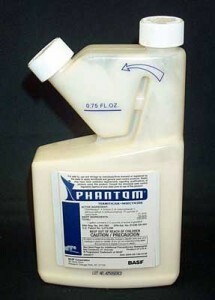 Phantom needs to be in its natural odorless state if its to be undetected by target pests. After you spray, let the treatment sit for at least one day and then set out CARPENTER ANT GEL where you see them foraging. In general, this will be up above where the spray was applied. Usually around countertops, in pantries our around windows, carpenter ant gel uses honey dew as its main attractant which is something carpenter ants cannot resist. They need this for their young and will readily grab up any they find. Typically harvested from trees, flowers and bushes, honey dew is essential for carpenter ant nests. Carpenter Ant gel also contains a non-repellent slow working active that will kick in once the feeding ants pass the active out as feces. Generally this will be done by the feeding young which in turn will kill them and the nurse ants handling their feces. Like the slow working spray, the bait will take several days to do its job so its common to see ants foraging for 5-7 days following the application. And if you still see them walking around 7 days after you apply some, renew the placements. To treat, you only need to make small dabs about the size of a grain of rice. These placements should be placed along ant trails and spaced about 2-3 feet apart. Do not place the gel on or close to a foraging ant; its best if you keep it close but not exactly on them. This way it will be something they “find” and more natural. This gel is packed in a small syringe like tube with a plunger and tip allowing you to disperse it in small amounts and then reseal it until you need to treat again. The 1 oz tube is usually enough to treat 1-2 rooms making 20-30 placements along the way. Renew placements once a week until you don’t see any activity. To protect your gel from dust and other contaminants, use REFILLABLE BAIT STATIONS. These stations come apart easily, measure just 2.5″ wide and will protect both the gel above and the granules below if you want to make clean placements which can be easily removed once the problem is resolved. If you’re seeing ants on your home exterior siding, they could be using some sections as part of their trail way or worse, for a nest. These areas can be treating using the PHANTOM AEROSOL listed above by spraying it up under the siding, into cracks and crevices and any gap or void they might be using. A better option for outside is the PHANTOM CONCENTRATE since it will last a lot longer, cover a larger area and overall, designed for the outside elements where the aerosol is not well suited. Expect to apply at least 1-2 gallons of mixed spray at the rate of 1/2 oz per gallon of water and be sure to spray the siding at least 6 feet up all the way down to the ground and then outward away from the foundation at least 3 feet. This ensures you’ll have a wide protective band over which foraging ants will surely walk and pick up chemical. If ants are mostly active out in the yard around a fence, railroad ties, trees, pine straw, etc., there is most likely nesting going on and to stop them from coming onto and into your home, you’ll need to do some yard spraying and baiting. To be successful treating large areas, you need to saturate the foliage, mulch, lawn, dirt and basically all surfaces ants can be trailing or nesting. 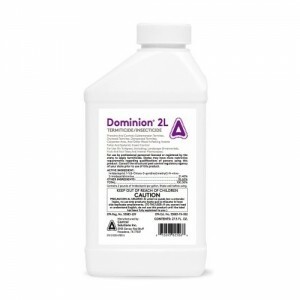 The best spray for the job is DOMINION 2L. Like the Phantom, its another non-repellent which ants can’t detect so you won’t cause them to scatter or re-route their trail ways when you spray. The difference is that is that Phantom is for use inside and on the home whereas the Dominion is not labeled for use inside but instead, over turf, mulch, etc. Dominion can be applied anywhere outside and you’ll need .5 oz per 1000 sq/ft. 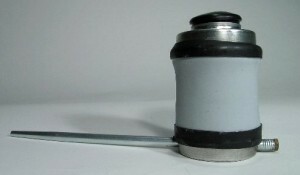 The small jug can treat up to 1 acre and should be applied twice to ensure the problem is controlled. What’s great about Dominion is that it will affect any ant foraging into your yard from neighbors, trees, etc. And it works on a range of pests, not just ants. Use a good HOSE END SPRAYER to make the application. Using our sprayer, you’ll need to add 10 oz of concentrate and then fill the sprayer with water. Use the entire amount over 1/2 acre using any standard garden hose. One treatment will generally control the problem but if expect to be spraying a few times annually to ensure new ants don’t come back. In general, once every 3 months will keep them under control. Remember, by keeping the population of carpenter ants down around your buildings, you will keep them from foraging inside. 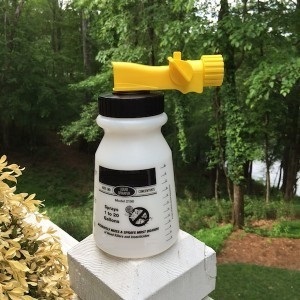 After spraying the yard, let it sit for at least one day and then for added protection, apply either MAXFORCE GRANULES or ADVANCE CARPENTER ANT BAIT. Both of these formulations work well on carpenter ants with the Maxforce being more flexible because it will also impact roaches and crickets. If you choose Maxforce, apply 1 oz per 1800 sq/ft feet. 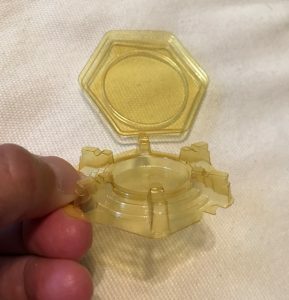 This product comes in a small jar and its top is much like a can of parmesan cheese so you can “shake” out the product as you walk around the yard. A little bit goes a long way and Maxforce is well suited for placement around trees, fence posts and flower beds where carpenter ants might forage. The small jar will treat up to 14,400 sq/ft and placements will last 30-60 days (or until the local ants eat it all!). 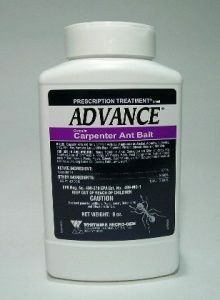 Advance Carpenter Ant bait works well too and is very specific to this pest. The application process is essentially the same with the rate slightly better. An 8 oz jar of this bait will cover up to 20,000 (1/2 acre) and should be applied every 30-60 days when ants are seen or active. If you know where the nest is located, a direct treatment can be quite effective. The key here is knowing where to treat because this approach though fast acting will only work if you have the exact location of their nest. To help locate the nest, spend time being a detective. And remember, there could be several nests. Rare is the time when only nest exists; most activity will involve 3-6 locations all working together. So if you spot 1-2 spots on a tree where you see them trailing and then disappearing, it would most likely mean you’ve spotted at least one nest. But don’t quit there. Instead follow the trailing ants to see where else they go. True, this will involve spending time around the outside of the home just watching them forage but it will be time well spent. The following video explains how to best inspect and figure out where ant trails go and nests might be lurking – even in direct sight. So after spending some time watching trailing ants and locating where you think they might be nesting, a direct treatment with DRIONE DUST could prove to be an effective way to proceed. Drione Dust works as a “dehydrator” on insects taking away vital moisture by cutting through their exoskeleton and allowing water to quickly escape. Drione is “light” and when puffed into cracks, crevices and voids, it will quickly penetrate in all directions filling their nest sites and killing all ants it touches. It won’t take much Drione to knock out the nest. In fact just 2-4 oz will usually be plenty. If you hit the nest directly, you’ll see ants crawling out and dying within minutes. Be sure to treat any cracks and crevices close to a nest and if you suspect other locations around the home they might be using, dust them too. You will need a HAND DUSTER to apply the Drione and this one works well. It will hold 2-3 oz of dust which is generally enough to treat one nest. The following video explains why Drione is such an effective tool on insects like carpenter ants. Remember, do not use liquid material on nest sights as it will certainly fail to reach all sections of the nest. Dusting is generally the best only choice and should be used in conjunction with the sprays and baits listed above. Drione has several benefits including a long lasting residual, a desiccant impact on all stages and where you treat, insects cannot live. This feature is important because applying Drione allows the user to eliminate nest sights one at a time. In most cases, cracks and crevices which are around the main nest sight will provide enough of a route for the dust to penetrate when you treat. But in some cases, drilling 1/4″ holes in window frames, wall voids or other places nests are thought to be might help. Holes will allow for better dust coverage and quicker control. To see just how Drione affects ants when you dust, watch this next video. In this clip you will see several carpenter ant nests treated and the treatment kills all the ants immediately. When you know where the carpenter ants are nesting, there isn’t anything better then Drione if you’re looking for quick control and immediate gratification! 1) If you are in an area where there are a lot of carpenter ants active around the home, you should address the outside turf with some Maxforce Granules or Carpenter Ant Granules. Intercepting foraging ants with either bait will help prevent nesting. But if you suspect there are nests on your property, first spray the yard with Dominion and then bait to knock them out. Bait alone won’t be enough to kill off nests but when used with Dominion, treating 1-2 a year will generally keep them from getting established. 2) If you occasionally see one or two ants in the home throughout the warm season and into the winter, be sure to bait and spray the outside as listed above but to be sure they aren’t in the home, apply Carpenter Ant Gel and Phantom spray. 3) If you know the exact location of a nest either outside or in the home, treat it directly with Drione Dust. This product will knock the nest out immediately and provide the fastest results possible. Carpenter ants are a major pest in the United States. 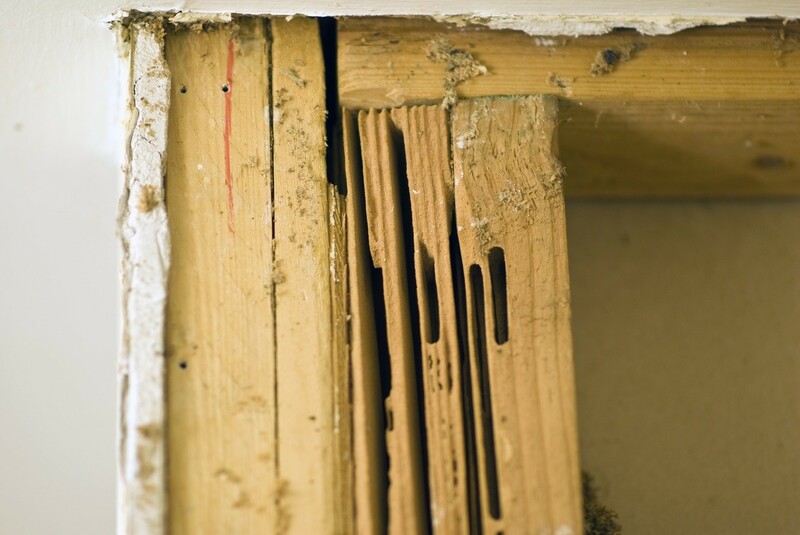 If left untreated, they will chew through wood causing untold damage. 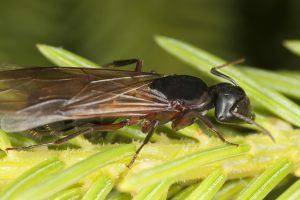 Since carpenter ants forage great distances and typically maintain several nest locations, it’s not easy to control local infestations unless you follow the treatment outlined above. Terrific article on the treatment of carpenter ants. I read through information on other sites but found none that are so thorough and understandable for a layman as yours. Thank you. Very informational site. I have done much of my own spraying but am concerned with the possibility of ants inside my garage door frame exterior wall. There is a white dust that looks and feels almost like plastic and when I clean it up I quickly find more. I have seen ants with and without wings but not lately, I assume because I sprayed fairly heavy. The dust seems to be coming from a space between the drywall and the door frame. There is either dry rot or ant damage in the bottom 8 inches of the garage door frame. No ants are seen when poking in the wood. Any recommendations from the limited information I provided? Should I get professional help. Will it be necessary to remove part of the drywall to physically confirm if there is damage? Is the garage door frame you’re talking about also known as the “door jam”? This would be the outside 2×6 or 2×8 frame that outlines the car door for the garage. Basically when the door is down, this frame can be seen surrounding it when looking at the door from outside. If yes, this part of the garage typically has problems with ants, termites and other insects where the wood meets the ground. So for starters, I’d do a thorough inspection of this area (especially each jam where it touches the ground) to see if its rotting, if there is any sign of termites, ants, etc. Next, I wouldn’t rule out old damage. I’ve seen many times where ants (and more specifically, carpenter ants) have chewed wood and then after the colony is killed, subtle amounts of dust start to appear for a good month or two following the initial control of the nest. This can “naturally” happen due to the garage door being opened and closed (the vibration and shaking when the door opens and closes can cause dust to release) or just the home settling can cause dust to drop. Also, abandoned nests tend to “dry” and fall apart leading to an accumulation of dust below where the nest was active. The same can happen when termites leave an area. Their mud tubes will in turn dry up and fall apart that can be seen as a type of dust which is typically gritty, kind of sandy. But to be sure there is nothing happening in the wall void, dusting it with Drione would be a good option. This dust will make the void unusable by any insect and is worth the time and effort to be sure the problem is resolved. Its easy to apply and lasts pretty much forever when applied to dry voids like a wall so its a one time treatment option. And dusting other parts of the garage that might be vulnerable is a good idea too. Thanks for the advice. Yes, there is activity in the door jam. The dust was reduced for a time after I sprayed but now there is an increased amount and I saw ants again tonight. I do have rotted wood at ground level but have been reluctant to repair it until I got rid of the ants. Do I need to be concerned with the integrity of the frame? If I open the drywall to inspect will I just cause the ants to move further into the house? At this point I’ll try the dust. Door jams are not important for the garage (they’re only present for cosmetic reasons) so even if it was damaged a bit, if you can’t damage don’t worry about it. 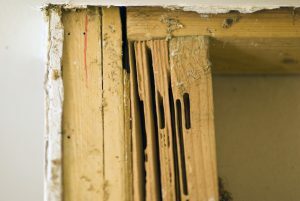 But if it has clear and distinct ant galleries caving in with soft spots throughout the wood, cutting out and replacing sections would be warranted. Of course if this was happening, it would be quite visible. Next, definitely don’t take down any wall covering. At least not yet. This would cause them to relocate so it would be best to first drill holes into any such space and dust the void if you thought they might be living in the space. And of course, dust as much of the garage jam too by targeting every little crack you can find. Now since the chances are high that where you see their frass (the saw dust you mention) is also where they’re nesting, dusting this area will probably be the key to the treatment and should prove to be the most important part. Lastly, the Drione is definitely the way to go to insure you get any close by nests that aren’t producing dust or saw dust (hidden nests). And once you dust and don’t have ant activity for 1 week or more, you can then go about exploring wall voids, etc. as you wish without concern or worry that you might relocate a nest.